How would you describe They Tell Me I’m The Bad Guy? It’s a noir crime novel set in a comics-inspired world. There are no capes, no spandex, no vigilantes. People with any kind of Post-Human ability make money on one side of the badge or the other; they use their powers or they cope with them. And when they do start throwing around what they can do, not everyone survives. It’s definitely not for the kids. I had someone tell me it’s like putting Pulp Fiction, Pineapple Express and X-Men together in a blender, which is a better way to describe it than anything I’ve come up with. What was the genesis of the book? I couldn’t find this story anywhere and desperately wanted to read it. That’s really it. Sorry. Being a book about superpowers, were your influences more from prose or from comics? Who or what was an influence on this? I kind of wrote in a vacuum as far as novels went because I didn’t want any other writer’s style to bleed through into mine. The main character’s narration had to be his own voice, and I had to find it and work it out for myself. Gregory McDonald’s original Fletch books were great illustrators that lean narration could work to my advantage, and I eventually found the voice I wanted. What I did draw from was more of the crime fiction, really trying to accentuate that angle of the story, the morally grey world more than the more sci-fi aspects. It’s the typical noir set-up: the main character, Donnie, is an ex-small time crook leading a simple life which, Spoiler Alert, gets turned upside down. The root of the story, however, is simply that I’ve been creating imaginary superheroes in my head since I was a kid. My childhood would be horrified to see where all those idle daydreams ended up going. Comics were definitely an influence. No one in particular inspired the story or influenced me as far as ‘Oh, I like that, I want to include something like that in here,’ but titles like John Ostrander’s Suicide Squad, which I discovered to my delight about halfway through writing this book, gave me some reassurance that populating my cast with irredeemable, amoral people wouldn’t make it any less enjoyable for an audience (laughs). There were specific tropes and conventions of the comic genre I wanted to play with, and I actually got more into comics during the process of writing it than I had been at the outset. More knowledgeable about them, anyway. I’d say probably the biggest influence, though, as to the writing and plotting were shows like COPS, Gangland, JAIL and Lockdown as well as articles about and interviews with criminals. I’ve always been interested in psychology, and those things helped me get into the mindset of these characters more than anything else. Also a great little book called Confessions of a Yakuza. Who is your favorite superhero and villain and why? The Flash. He was the first superhero I was really exposed to as a kid through the old CBS TV show. For a hyperactive kid who could never slow down, the idea of being able to do everything that fast and just be a powerhouse was thrilling. It still is! Wally and Barry have the greatest power set in comics. As for villains, Johnny Sorrow is my main go-to. I don’t know what it is, I can’t explain it, but the guy’s look, his ruthless don’t-give-a-damn-attitude and his boss the King of Tears (greatest Final Boss in comics) just hits all the right chords for me. His head is a floating mask. That’s just awesome. He just barely beats out the Pangean from Tom Strong. Zoom, Parasite, Killer Frost, Metallo, Brainiac, and Typhoon are all tied for third place. I would kill to write an all-villains comic. What are you currently geeking out over? I’m currently in the midst of severe Breaking Bad withdrawals, but the new seasons of Archer and Justified start up next month so there’s that thought to make it through a cold, empty December. I’ve been devouring old hardboiled detective stories when I can in preparation for a new book I’ll be working on, but DC’s new 52 relaunch has monopolized so much of my reading, particularly Morrison’s Action Comics, Didio and Giffen’s throwback O.M.A.C. title, T.H.U.N.D.E.R. Agents by Nick Spencer and Azzarello’s Wonder Woman. Remender’s Venom and Rucka’s Punisher have kind of opened my door to getting into Marvel a bit more. Oh, and Warren Ellis’ Fell is coming back next year along with Busiek’s Astro City (I think)! And the Black Keys just came out with a new album I’ll have to get sometime soon. I haven’t gotten much music since I filled up my ancient first-gen iPod. In ten words or less, why should people read this book? 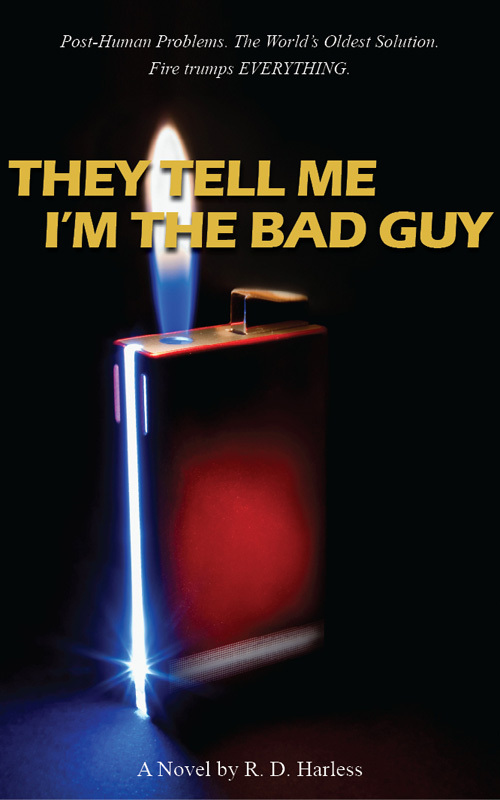 They Tell Me I’m The Bad Guy is currently available for the Nook, Kindle, Kobo, and via the Diesel e-book store. Want to read it? Leave a comment recommending your favorite book for an opportunity to win a digital download through December 31st! Be sure to include your email! FOG! Chats With Thriller Author, JON LAND! The Man From Hong Kong Chats With The Human Tornado, CASANOVA WONG! FOG! Chats With Tom Peyer About AHOY Comics!